Gerriets began offering roll out dance flooring (commonly known as marley floor) 40 years ago by introducing our VARIO CLASSIC Reversible vinyl dance floor. VARIO CLASSIC Reversible is our top-selling dance floor, but we have greatly expanded our line by offering floors with cushioning and flooring for permanent applications and heavy-duty usage. We also offer a modular VARIO ERGODANCE Sprung Floor that can be custom-made to your studio dimensions. Our selection of marley dance floors offer choices for any style of dance and are found in studios and theaters around the world, including San Francisco Ballet, Ballet Jorgen, Hubbard Street Dance, The School of Contemporary Dancers, Trainor Dance-NYC and Legacy Dance Championships. Gerriets is also proud to be the preferred flooring vendor for the Association of Dance Conventions and Competitions. For ALL dance styles, from ballet, to modern to tap. VARIO CLASSIC Reversible vinyl floor is an extremely durable double sided dance floor with a non-reflective, slip-resistant surface that lies completely flat, typically called "marley floor" in the dance and entertainment industry. Used extensively in dance studios, by touring companies, and as a stage floor, this floor is available in six different reversible color combinations. It can be used in temporary applications as well as a semi-permanent floor. Recommended for taped installations, ideally over a raised or sprung floor. VARIO 2.0 offers dancers a myriad of benefits and features. A 2.0 mm thick, heavy-duty marley dance floor suitable for ANY style of dance – Ballet, Contemporary, Pointe, Modern, Jazz, Tap, Lyrical, Irish Dance, Flamenco, as well as for heavy-duty theatrical use. 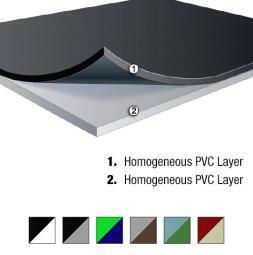 VARIO 2.0 is manufactured from two layers of crisscrossing PVC, this prevents the material from pulling and stretching, giving it dimensional stability without the use of a fiber-reinforcement layer. 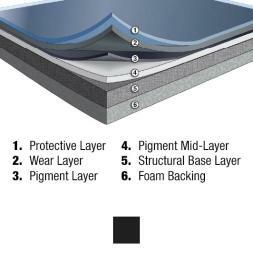 These dual-layers provide durability and strength whether placed in a dance studio, or used as a stage floor in performing arts centers and by touring companies. VARIO 2.0 can be installed with the seams taped or permanently with adhesive. VARIO 2.4 is our heaviest and sturdiest dance floor! VARIO 2.4 is a robust double sided PVC vinyl floor, 2.4 MM thick, offering Dance Studios, Theatres, Performing Arts Centers and Educational Institutions a heavy-duty, multi-purpose dance floor with versatility, as it is suitable for all forms of dance. VARIO 2.4 is intended for permanent installations only over a sprung or raised floor. Vario 2.4 is made with a different color on each side, offering even more options when a permanent floor is needed, as you can install either side. Options are Black/White and Dark Gray/Gray. For Modern, Lyrical, Contemporary, Hip Hop, and Ballroom or Social Dancing. 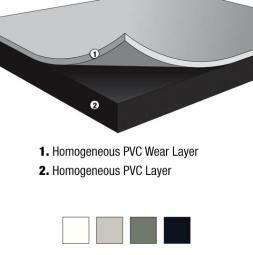 VARIO UNI is a durable, single-sided vinyl dance floor, with a similar surface to our Vario Reversible but provides a layer of cushioning as well. 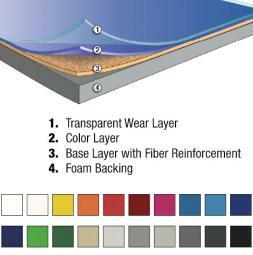 VARIO UNI is manufactured with 4 layers; a clear protective layer on top, a matte color layer, a base layer of fiberglass reinforcement for dimensional stability, and a foam backing layer applied on the bottom for comfort and traction. VARIO UNI is available in 20 standard matte colors, including enough shades of grey, beige, red and blue, sure to satisfy any studio owner or designer. VARIO UNI can be used as a portable, semi-permanent or permanent floor. VARIO UNI’s cushioning offers some protection against hard surfaces and It can also be installed over a sprung floor or used on stage when cushioning is needed. Available in 20 different matte colors. For Contemporary Dance, Lyrical, Hip Hop, Salsa, Zoomba, Aerobic Activities, and Yoga. VARIO ALLROUND is a professional vinyl dance floor developed in collaboration with Gregor Seyffert & Company, a leading international dance company. The floor is manufactured with a glass fiber reinforced mesh which keeps it dimensionally stable and lays completely flat, a perfect floor for studio or touring installations. It also features a cushioned backing that reduces stress on the muscles and joints as well as a matte, slip-resistant surface, all of which makes it the floor of choice for professional dancers. 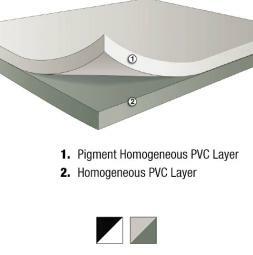 VARIO ALLROUND can be used as a portable floor or installed semi-permanently or permanently with adhesive. The cushioning offers some protection against hard surfaces, and it can also be used over a sprung floor or portability over a stage when cushioning is needed.